The words below don’t necessarily relate to children, but they are the kind of words used by adults in Charles Dickens novels to describe miserable orphans. If you happen to be a young person and any of these words describe you, please stop. Modify your behavior immediately. If you are a parent and any of these words describe your children, you have my sympathies. But your family will not be invited over any time soon. If you are a prospective babysitter or nanny and any of these words are used to describe the darlings during the initial interview, I strongly suggest you look elsewhere for employment. If you are a teacher, I recommend you use these words with your students whenever appropriate. It may not correct their behavior, but you may at least improve their vocabulary. Recalcitrant means “stubbornly unwilling to obey authority.” A recalcitrant child is difficult to deal with and not inclined to obey. Petulant means “childishly irritable.” It means grumpy, grouchy, bad-tempered. Insolent and impertinent are synonyms. They are fancy ways of saying insulting, rude, or cheeky. Contumacious and recalcitrant are synonyms. They mean willfully disobedient, rebellious. One who is insubordinate, like the recalcitrant and contumacious, refuse to be placed under authority. Obstreperous means “loud and unruly; boisterous.” An obstreperous child is resistant to restraint or control. Truculent means fierce, cruel, brutal, and hostile. Churlish means rude (like a churl or peasant). It also implies being difficult or unpleasant to deal with. If you have something to say, leave it in the Reply section below. Just please don’t be peevish, petulant or churlish. Great words! I’ve been using truculent incorrectly! Thanks for setting me straight. Teresa, the article isn’t about “dealing better with children.” It’s not about parenting. It’s about words. I don’t think the author is suggesting that kids are really bad. 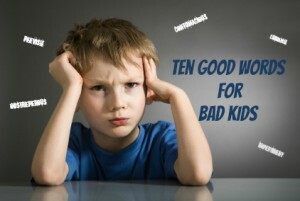 I find it ironic that this article focuses on advancing vocabulary in dealing better with children and the article uses in it’s title “Bad Children”. Is It necessary to point out that children are not bad, a childs behavior may be and that is what one address? This bothers me exceedingly.